Porsche Factory driver Michael Christensen kept a tight grip on the wheel during an exciting third and fourth race of the 2018 Pirelli World Challenge Series this past weekend. 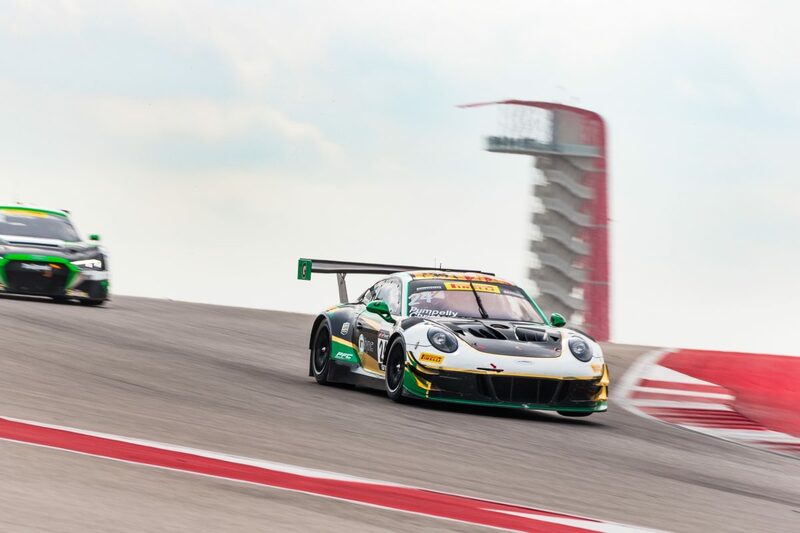 Christensen, fellow driver Spencer Pumpelly and the Alegra Motorsports team fought tooth and nail at the Austin, Texas track, Circuit of the Americas, combating a series of unfortunate events that left them shy on their goal of improving on the P5 and P4 finishes of the Series’ first two races, but motivated to come out even stronger at the next event. After several days of testing on the renowned F1 track and discovering a few gremlins hiding in the car’s various systems, Christensen took to the track for the qualifying round and finished in P8, right in the middle of the pack. Unfortunately, with the car still reluctant to hit its full stride and an incident during a pit stop that cost precious seconds during race 3, the team was unable to gain any positions and ended up finishing the day in P8. Placement on the starting line for race two was determined by the previous days’ lap times, which meant Pumpelly would be slightly further back, in P12. The seasoned Porsche specialist drove tactfully, though, navigating some exciting bumper-to-bumper exchanges early on—a run in with a Corvette actually left a piece of metal on the Porsche’s rear bumper—and delivering the number 24 Porsche safely into the pit lane and into the hands of the Michael Christensen. In what would prove to be another turning point, the crew then executed the fastest pit stop of the race and set Christensen out with real momentum. And that momentum would carry—boy, would it ever! Christensen drove like an angry Dane for the final 25 minutes of the 60-minute race, relentlessly pursuing the next leading car and ultimately taking four positions to finish once more in P8. So, despite missing the podium, there was a surge of energy at the end of the demanding pair of races that Christensen and the team will look to carry into the next race, taking place April 13-15 on the streets of Long Beach, California.